Happy Monday and one week Christmas countdown! I’m still doing some shopping but hoping to be finished with everything this week so I’m not scrambling and fighting crowds over the weekend. Tis the season. I wanted to share this fun bell sleeve shift dress that I think would be perfect for the holidays, or even an event into the new year. We thought about going out to celebrate New Years since it’s our last one without a baby, but we eventually decided to stay in. I still wanted to get dressed up… I had a few too many days of post-holiday laziness in lounge wear. So I put on this new dress (it’s a little short right now due to the growing bump) with tights and that was enough for me. I’ve been a long time fan of the brand Show Me Your Mumu. 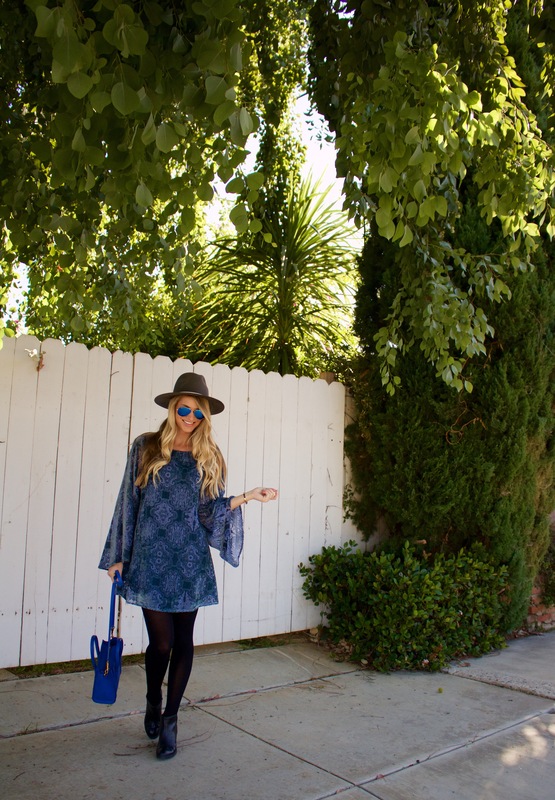 It’s such a fun, boho, California cool line of pieces I want to live in. This dress is perfect for fall/winter. It’s been a bit cooler here lately so I wore it over tights the other day. I was thinking it would be the perfect dress to wear with the over the knee boots I’m lusting after right now. Swing dresses are so playful and I love how they can be dressed up or down with the right tweaks. Ok, so I bought this shirt a few weeks ago and it hasn’t even made it into my closet yet! Do you have any items you wear so much when you get them because they just go with everything? It was also the perfect piece this holiday season; I wore it to my company party, to a family dinner and out with friends. I wore this outfit to a holiday party the other day and totally matched the gray gloomy weather. Hope you’re enjoying the holidays! It’s only been chilly here for a few weeks but I was missing my summer clothes. Luckily a pair of black tights are versatile enough to wear with pretty much anything. I’ve been loving army jackets this season. I bought this one last month after I was ill prepared for a weekend away and d I like how aztec print gives it a more unique feel.